Radiotherapy, also called radiation therapy, is the treatment of cancer and other diseases with ionizing radiation. Ionizing radiation deposits energy that injures or destroys cells in the area being treated (the target tissue) by damaging the genetic material (DNA) in the individual cells, making it impossible for them to continue to grow. Although radiation damages both cancer cells and normal cells, normal, healthy cells are able to repair themselves and return to proper functioning.Radiotherapy may be used to treat localized solid tumors, such as those cancers associated with the oral environment. It can also be used to treat leukemia and lymphoma (cancers of the blood-forming cells and lymphatic system, respectively). Prior to starting radiation therapy treatments a planning session, or simulation, is conducted. This involves special x-rays or CAT scan pictures and measurements of the area to be treated, as well as markings (long lasting, but not permanent tattoos) being placed on the patient’s skin to help with positioning during the actual treatments. This planning session may take up to an hour to complete, but is essential in providing data for optimal treatment planning. For oral cancers, as well as most head and neck cancers, a porous mesh mask will be made during this procedure. When used in the radiation treatment room, the mask immobilizes the patients’ head during treatment. This is very important so that radiation will only be delivered to the designated areas. 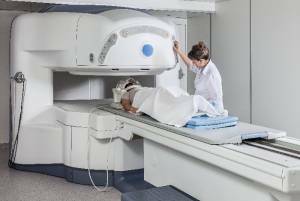 The total dose of radiation therapy prescribed by the radiation oncologist is broken down into small amounts (fractions) which are given on a daily basis, usually five days in a row with a two day break each week. It has been found that patients better tolerate the smaller daily doses while still receiving the maximum benefit of the treatments. Normally, each daily treatment lasts about 10 to 15 minutes, with the majority of this time spent making sure the radiation blocking devices, which limit the radiation to the appropriate area are properly in place, and the patient and machine are properly positioned. It actually takes more time to set up the machine and the patient than it does to deliver the dose of radiation. The staff members who are responsible for managing the daily radiation therapy treatments have received specialized education and certification and are called radiation therapists. The reason that the treatment course for some cancers is so relatively long (2-8 weeks) is to allow for normal tissue repair after each exposure to radiation, and to minimize permanent injury. (Tissue repair can also be helped by proper nutrition and a positive mental state. See recommendations for nutrition during treatment elsewhere on this site.) The daily dose must also be great enough to destroy the cancer cell while sparing the normal tissues of excessive levels of radiation. This balancing act forms the basis of modern radiation therapy. One type of radiation therapy commonly used involves photons, “packets” of energy. X-rays were the first form of photon radiation to be used to treat cancer. Depending on the amount of energy they possess, the rays can be used to destroy cancer cells on the surface of an area, or penetrate to tissues deeper in the body. The higher the energy of the x-ray beam, the deeper the x-rays can go into the target tissue. Linear accelerators and betatrons are machines that produce x-rays of increasingly greater energy. The use of machines to focus radiation (such as x-rays) on a cancer site is called external beam radiotherapy. With modern radiation equipment, there is minimal scatter of x-ray energy outside the treatment beam. Scatter refers to the presence of radiation in the body outside the field of treatment. Imagine a beam of light from a flashlight projected on a wall. The visible beam of the light is well defined (equivalent to the radiation beam) with only a slight halo of light around the edges (equivalent to the scatter). In radiation therapy, a sharply defined x-ray beam minimizes the side effects of treatment because only small amounts of radiation travel to other parts of the body. Gamma rays are another form of photons used in radiotherapy. Gamma rays are produced spontaneously as certain elements (such as radium, uranium, and cobalt 60) release radiation as they decompose, or decay. Each element decays at a specific rate and gives off energy in the form of gamma rays and other particles. X-rays and gamma rays have the same effect on cancer cells. Another technique for delivering radiation to cancer cells is to place radioactive implants directly into a tumor or body cavity. This is called internal radiotherapy. (Brachytherapy, interstitial irradiation, and intracavitary irradiation are types of internal radiotherapy.) In this treatment, the radiation dose is concentrated in a small area. Internal radiotherapy is sometimes used for cancers of the tongue, uterus, prostate, and cervix. One of the advantages of this type of therapy is there is less radiation exposure to other parts of the body. Several new approaches to radiation therapy are being evaluated to determine their effectiveness in treating cancer. One such technique is intraoperative irradiation, in which a large dose of external radiation is directed at the tumor and surrounding tissue during surgery. Another investigational approach is particle beam radiation therapy. This type of therapy differs from photon radiotherapy in that it involves the use of fast-moving subatomic particles to treat localized cancers. A very sophisticated machine is needed to produce and accelerate the particles required for this procedure. Some particles (neutrons, pions, and heavy ions) deposit more energy along the path they take through tissue than do x-rays or gamma rays, thus causing more damage to the cells they hit. This type of radiation is often referred to as high linear energy transfer (high LET) radiation. 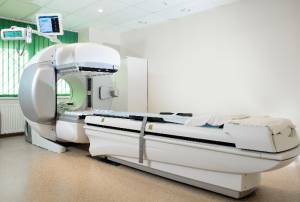 Scientists also are looking for ways to increase the effectiveness of existing radiation therapy techniques. Two types of investigational drugs are being studied for their effect on cells undergoing radiation. These drugs called Radiosensitizers, make the tumor cells more likely to be damaged, and other drugs called radioprotectors, protect normal tissues from the effects of radiation. Hyperthermia, or the use of heat, is also being studied for its effectiveness in sensitizing tissues to radiation. Other recent radiotherapy research has focused on the use of radiolabeled antibodies to deliver doses of radiation directly to the cancer site (radioimmunotherapy). Antibodies are highly specific proteins that are made by the body in response to the presence of antigens (substances recognized as foreign by the immune system). Some tumor cells contain specific antigens that trigger the body’s immune system to produce tumor-specific antibodies. Large quantities of these antibodies can be made in the laboratory and attached to radioactive substances (a process known as radiolabeling). Once injected into the body, the antibodies actively seek out the cancer cells, which are destroyed by the cell-killing (cytotoxic) action of the radiation. The benefit to this approach is that it can minimize the risk of radiation damage to the body’s healthy cells. The success of this technique will depend upon both the identification of appropriate radioactive substances and determination of the safe and effective dose of radiation that can be delivered in this way. Radiation therapy may be used alone or in combination with chemotherapy or surgery. Like all forms of cancer treatment, radiation therapy can have side effects. Possible side effects of treatment with radiation include temporary or permanent loss of hair in the area being treated, mild to severe skin irritation, temporary change in skin color in the treated area, nausea, and tiredness. Exposure of the oral cavity to radiation will produce mucositis, making the interior of the mouth quite sore. This will resolve after the radiation treatments have been completed. Another complication associated with radiation treatment of the oral cavity or throat, is xerostomia. It is not uncommon to have the salivary glands damaged during the course of treatment. This results in a permanent loss of salivary function (xerostomia). New techniques such as IMRT (intensity modulated radiotherapy) are being implemented at more cancer centers, which can avoid this collateral damage to the salivary glands. Using a different software program to administer the radiation from multiple angles in smaller doses, this technique also includes a new shuttering device to limit the size of the radiation beams which are emitted, thus missing the glands and sparing them any exposure to the destructive radiation.